Alexis and JaHavon first met in 2011 on the dating site My Yearbook. "Online love is real people!" joked Alexis. JaHavon sent Alexis a simple "Hello," which Alexis did not immediately see, but she responded a few days later. After talking off and on for about six months, they met for the first time on New Years Eve. Alexis was apprehensive to meet him because you cannot always tell what people are really like over the Internet. However, JaHavon drove the four hours to see Alexis and when he stopped in to the Walmart where she was working to pick her up for their first real date Alexis was pleasantly surprised because he was even cuter in person. After their first weekend together, JaHavon was making the drive almost every weekend to see Alexis even while working brutal 10-hour shifts and finishing up school. They were falling in love, but Alexis did not want a long distance relationship so she called JaHavon one evening after work and said that she loved him and made the decision to move to East Texas to be with him. "It was the best decision of my life," said Alexis. 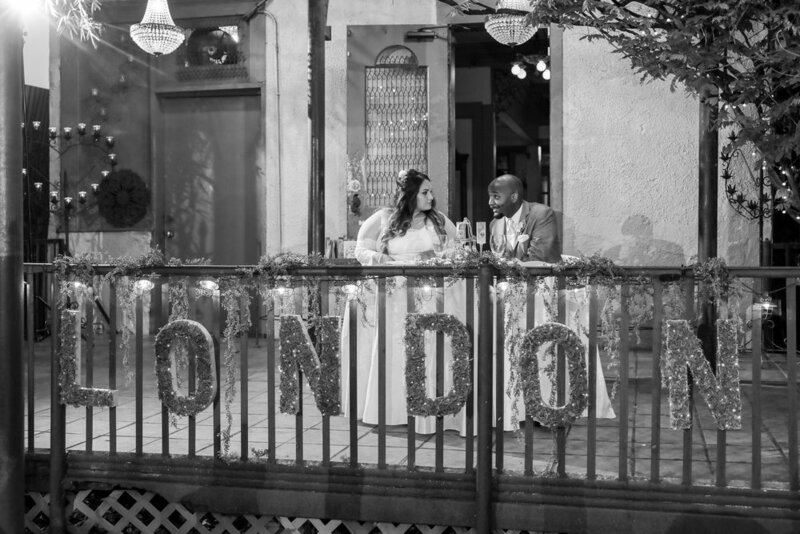 After five years together, Alexis and JaHavon knew that they were ready for forever. Alexis wanted to be the one to propose to JaHavon so she went out a purchased a ring, but when she asked him he said "No" because he wanted to be the one to propose first. "I tried not to let it get to me and left the ring in my purse," explained Alexis. A few months later, the couple attended the Magical Winter Lights Festival in La Marque, Texas with some family and friends. When they were standing under the Eiffel Tower sculpture, Alexis' mom asked to take a picture of the couple. As Alexis tried to brush her hair out of her face for the picture, JaHavon got on one knee and asked her to marry him. Alexis was in complete shock and froze up for a minute. "All I remember next is everyone yelling 'Say yes!'" said Alexis. "And I did." Alexis and JaHavon married on April, 8th, 2018 at the historic AvantGarden in Houston, Texas. It was actually the very first venue Alexis toured, but she did not immediately book it because she did not expect the process to be so easy. They thought about potentially doing a destination beach wedding in St. Thomas and made some plans, but after a bad hurricane season they decided to stay local and they reverted back to AvantGarden. Alexis loved it's vintage vibe and it was within their $18,600 budget. The couple initially hoped to keep everything under $15,000, but even with DIY-ing all of the decor, Alexis went a little over their initial projections to really wow their 75 guests. They day was a mix of classic vintage with garden romance. They filled the venue with roses in blush pink and creamy white and scattered eucalyptus throughout. "I just wanted everyone to have fun and dance," said Alexis. "But I really wanted the venue to wow people." At night, the light emanating from the thousands of twinkle lights around the patio made everything look like magic. Alexis' favorite part of the day was watching her husband dance with his mother. His mom said something to him while on the dance floor that made them both tear up. When he got back to Alexis she asked him what his mom said and he told her that she gave him some advice: marriage is not easy, but it is rewarding and he needs to treat Alexis right. "There's beauty in seeing a strong man so vulnerable," remarked Alexis. "It was a beautiful moment." JaHavon's favorite part was watching Alexis walk down the aisle toward him her beautiful, heartfelt vows. "Oh and the cake eating!!" added JaHavon. The biggest challenge for Alexis was the planning process itself. She had never been to a wedding before so she was really nervous that she would miss some big, important detail. In the end, the only thing that she forgot was the aisle runner. "I would give myself a 9/10," joked Alexis. Her advice to other members of the Big Bride Club: "Plan early, budget realistically, and don't be afraid to DIY."